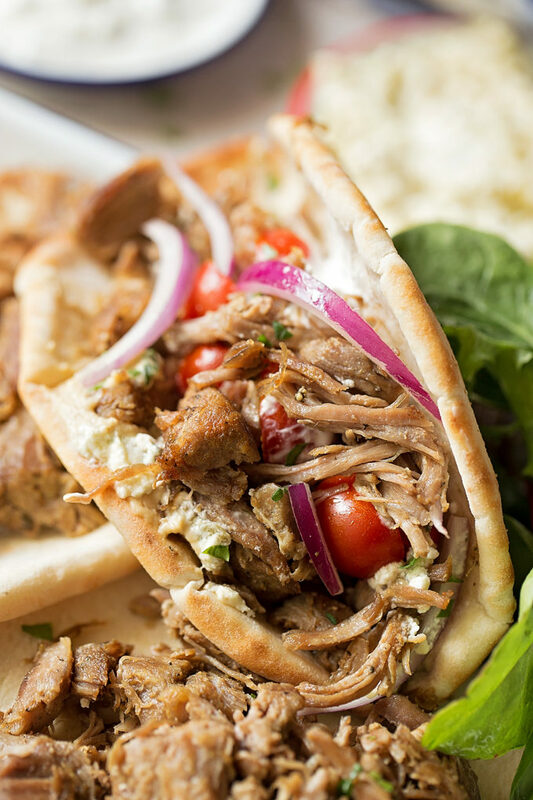 These Instant Pot pork gyros are incredibly flavorful and practically effortless! Wrap them in a pita with some red onion, cherry tomatoes, hummus, feta and tzatziki and you’ve got a delicious meal! 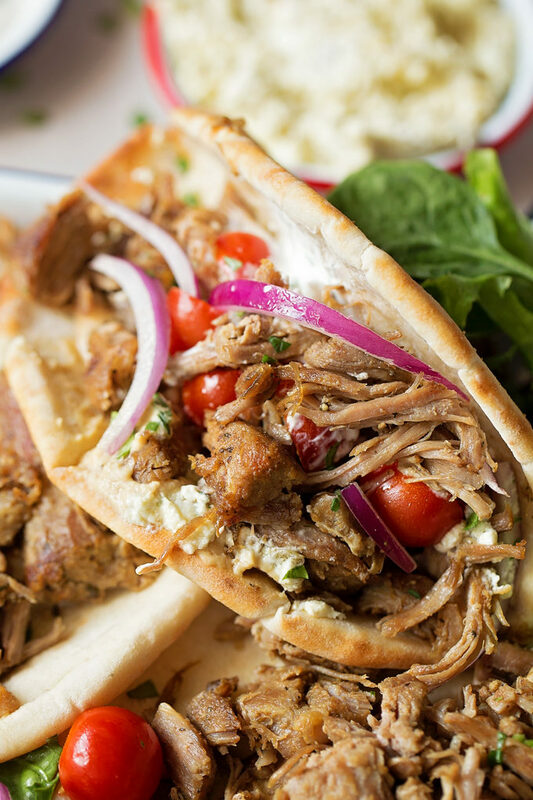 When we lived in Salt Lake City there were a few Greek/Mediterranean restaurants that served amazing gyros and doners. We still haven’t found a good place here in D.C. but as soon as I can eat ‘normal’ food again, we definitely will. For now this Instant Pot version will do. It’s easy, flavorful and practically effortless. 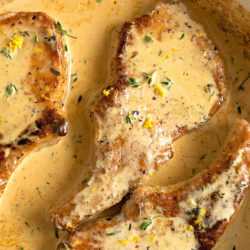 Want to make this for a quick weeknight dinner? It’s totally doable. 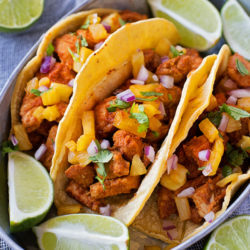 What to double this recipe for a special occasion? Also totally doable. What’s great about this is that while the pork is cooking you can prep everything else (which only takes about 10 minutes), get the dishes washed up, plates and serve ware ready and be good to go as soon as it is. 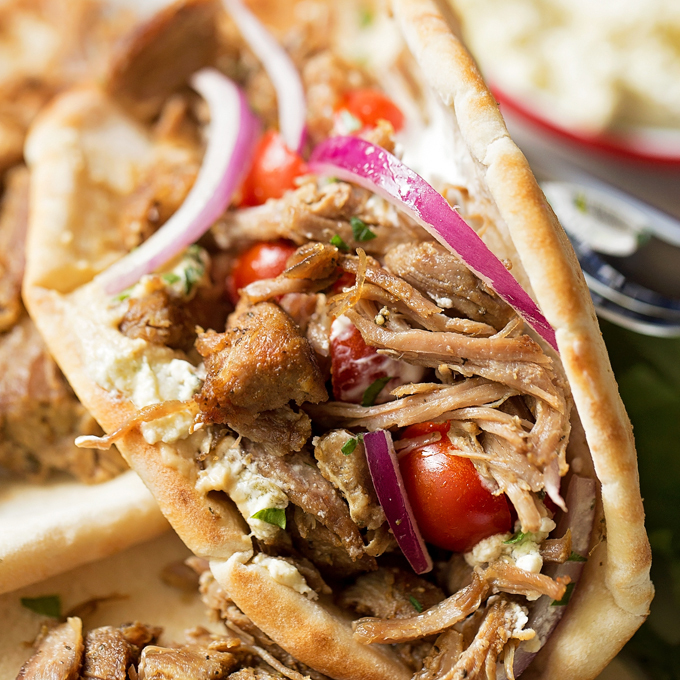 What do you need to make Instant Pot pork gyros? You’ll want to start by trimming off excess fat from the pork and cutting it into 2-inch cubes. Turn the Instant Pot onto SAUTE mode and add the pork as you cut it. This will help it brown, which means more flavor! Once all of the pork is in, add the spices, followed by two whole cloves of peeled garlic and chicken broth. Next comes the fun part: frying the pork on the stovetop. Do not be afraid of this step. If it really worries you I’d suggest following the oven method I used for carnitas, but I went all in this time and I have no regrets. It tastes so much better!! Just place a large non-stick skillet over medium heat, add the oil and wait till it gets nice and hot. 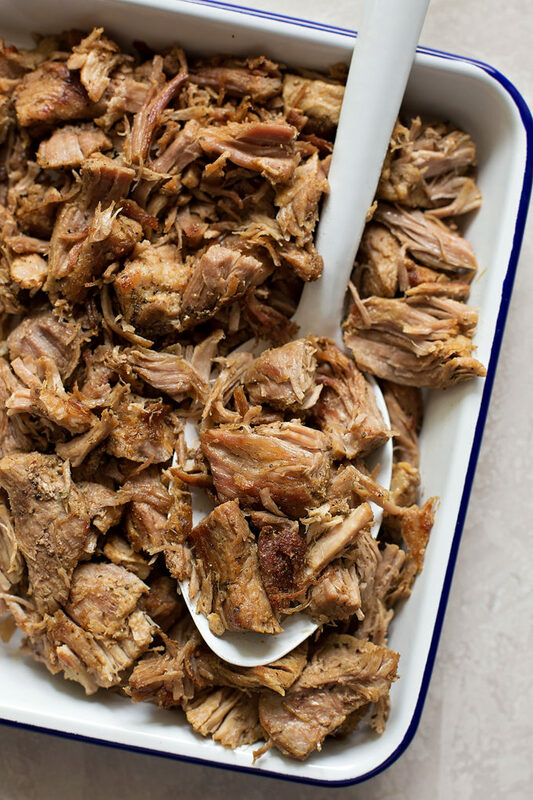 Use tongs to transfer the pork from the Instant Pot to the pan. Make sure to shake off any excess moisture so you don’t splatter hot oil all over. It should only take a few minutes on each side to get the pork nice and crispy. Use some of the leftover cooking liquid to rehydrate the pork once you’re done. Just toss everything together in a bowl and it’s good. Pile your pork onto a pita or wrap it in lavash. Add all of your favorites like red onion, cherry tomatoes, lettuce, feta, hummus, and tzatziki. Crispy chickpeas, pepperoncinis, french fries (trust me on this one) and cucumbers all make great additions. 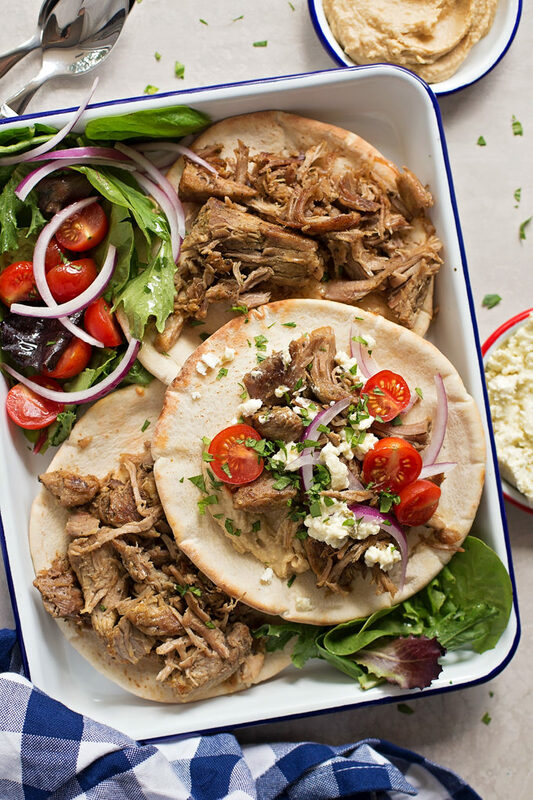 This recipe for Instant Pot Pork Gyros has a HUGE hit at our house- we didn’t have any leftovers! It’s something I plan on making over and over again, and I hope you will too! 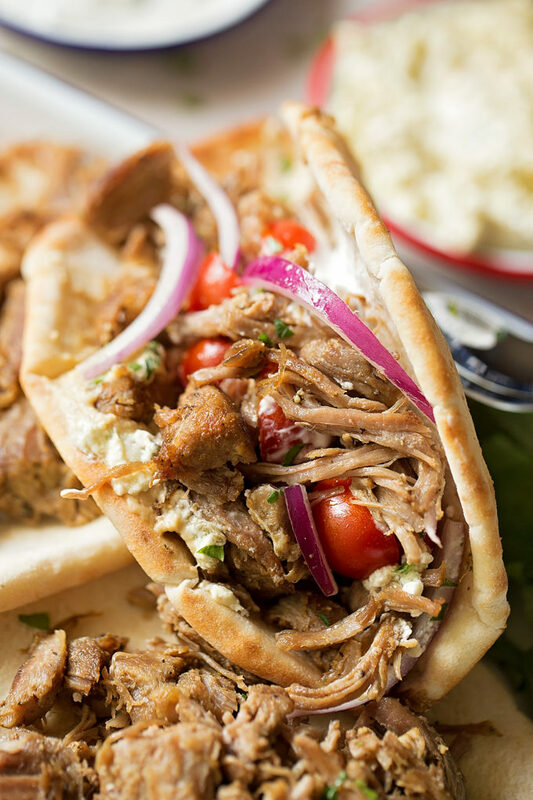 These Instant Pot pork gyros are incredibly flavorful and practically effortless! Wrap them in a pita with some red onion, cherry tomatoes, hummus, feta and tzatziki and you've got a delicious meal! Turn the Instant Pot® on the SAUTE setting. Add the pork to the pot. Add seasonings and chicken broth. Place the lid on the Instant Pot® and pressure cook on the MANUAL setting for 35 minutes. After the pork has fully cooked, allow the pressure to come down naturally for 15 minutes, then turn the valve to venting for a quick release. Once the valve pops, remove the lid. Using tongs gently break apart the pork. In a large nonstick skillet set over medium heat, add the oil. Once the oil is hot, carefully add the pork (use tongs to prevent too much liquid from transferring to the pan) and cook until crispy and golden brown. Let the pork cook on one side for 2-3 minutes, flip and cook again. Remove the pork from the pan and transfer to a bowl. 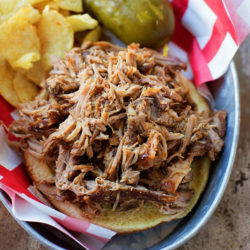 Toss pork with a few tablespoons of the cooking liquid. Assemble pitas and serve immediately. - Other great toppings include romaine, crispy chickpeas or french fries. Thanks for the recipe! Although it didn’t taste like gyros meat, it was really flavorful and we enjoyed it quite a bit!